Summon: The Merchant shows you two cards he has for sale. Choose one to put into your hand. He puts the other into your opponent's hand. 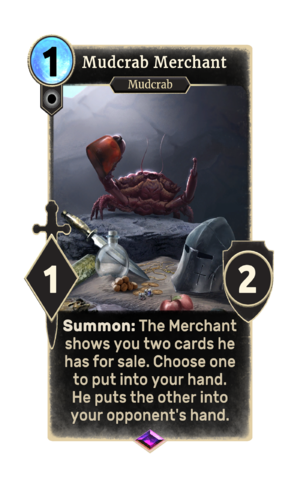 Mudcrab Merchant is an epic Neutral creature card. It is part of the Houses of Morrowind expansion. "Talking. Mudcrab. Merchant. Read my lips. Uh. Mouthparts?" "Did I stutter or somethin'?" The card previously had 3 health, but this was decreased in patch 1.72.4. Background: "Whaddaya think? Sheesh. I'm a mudcarb... crab. Shure. A mudcrab. Thas me. Pretty sure. I LOOK like a mudcrab, right? Mush be. Thish IS me talking, right? So? I mush be... A talking mudcrab. And I sells stuff, right? So? I mush be a talking mudcrab merchant. Stands to reason, don't it?" Talking mudcrab merchant: "Sure. Thash what I said? Did I stutter or shomethin? Talking. Mudcrab. Merchant. Read my lips. Ehr. Mouthparts? Read my mouthparts? Shomethin ain't right. But never mind. Jush one-a life's little myshteries. So. You gonna buy shomethin? Or sit here jawin' all day." This page was last modified on 3 March 2019, at 13:48.